Regardless of how often we complain about something else getting rebooted, remade or re-imagined, the truth of the matter is that as long as they keep making money, the studios will keep making the movies. The latest to get new life is Child's Play. 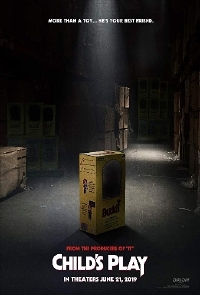 Directed by Lars Klevberg, who has another horror movie coming out this year called Polaroid, the remake stars Aubrey Plaza as the unsuspecting mother who gifts her son the possessed Chucky doll that will eventually go around killing people. Toted as coming from the producers of the rather good It remake, I guess that's supposed to make us feel a little less uneasy about the fact that this looks mediocre at best. I'll say this for the trailer: the fact we don't see Chucky at all during the trailer, and don't hear his name until just before the title appears, is working in the movie's benefit but that's just great trailer editing and not a good indicator of the quality of the movie.